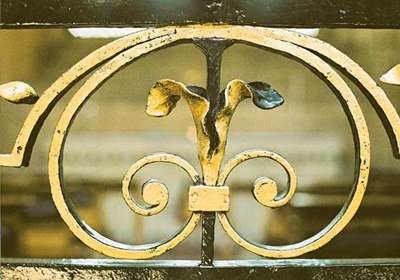 The term 'wrought ironwork' is often loosely used to mean decorative forged metalwork, including steelwork. Elaborate gates and railings immediately spring to mind. However, not all wrought ironwork is decorative, and steel, which was only introduced in 1856, is a very different material in both form and performance. As the oldest form of iron to be used, wrought iron is the material which gave the Iron Age its name. Architecturally its importance for fixings and fastenings was established long before the need for railings and decorative balustrades materialised, and some of the oldest examples of wrought ironwork include nails and spikes as well as agricultural implements and arms. However its decorative potential was also recognised and some of the earliest examples of the material's use include jewellery. Many wonderful examples of medieval wrought ironwork survive in churches, houses and other buildings throughout Britain, including huge wrought iron hinges, simply ornamented latches and heavy drop handles. 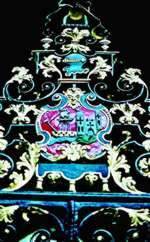 17th century window catches were often given fleur-de-lys back plates and wild flourishes of wrought ironwork on the handles. 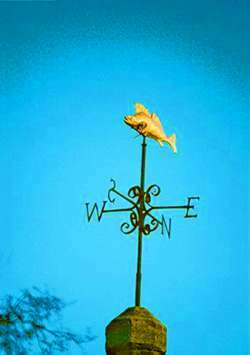 Other examples include the windows themselves and weathervanes. Cast iron, wrought iron, mild steel and stainless steel are the main forms of iron used historically. Of these, cast iron is the only one which is not forged. This material has a granular structure as a result of the cooling process, which makes it much stronger in compression than in tension. Main commercial production of cast iron began in the late 18th century. The earliest wrought iron is known as 'charcoal iron'. At first it was produced by the 'direct reduction' process. Iron ore (iron oxide with various impurities) was smelted by heating it with charcoal in small furnaces called 'bloomeries'. The charcoal (essentially carbon) reduced the iron oxide to iron, giving off carbon monoxide in the process (Fe2O3 + 3C → 2Fe + 3CO). Much of the mineral impurities or 'slag', which included iron silicate in particular, remained in the iron. After smelting, the 'blooms' of iron were forged by heating to red hot and then beating them out into long bars. Each bar was then cut into shorter lengths, bundled together and reforged. The process could be repeated many times. With each forging, more of the slag was removed, and the fine residues left behind became integrally incorporated with the iron, together forming the distinctive fibrous microstructure which gives wrought iron its tensile strength. The iron produced could be of excellent quality, but it was a laborious process. Blast furnaces introduced from Belgium around 1400 enabled production to increase and resulted in a considerable reduction in impurities. Iron ore was first smelted with charcoal in the blast furnace much as before, producing cast 'pig' iron. But then in a second stage the iron was further refined by 'decarburization', the removal of carbon, before being forged. Further improvements in production included the introduction of heavy hammers set on a fulcrum to beat the semi-molten metal bloom to remove slag. Water-powered rolling mills, introduced in the late 16th century, helped to mechanise the forging process; the red-hot bars were passed between two heavy rollers (the 'mill'), becoming longer and thinner each time. Coke, a modified form of coal, was used instead of charcoal by Abraham Derby at Coalbrookdale after 1709 as the supply of timber for new charcoal was rapidly being exhausted, and in 1784 Henry Cort invented the 'puddling' process in which the iron ore and coke were kept separate in the furnace. By the mid-19th century, wrought iron was considered relatively expensive. Cast iron, although weak in tension, was mass-produced and was therefore much cheaper. Being cast, the forms which could be produced were very different, but they were none-the-less equally beautiful, and for most decorative purposes, cast iron provided a more cost-effective solution. For structural applications, cast iron replaced wrought iron wherever loads were carried in compression, such as columns, but wrought iron continued to be used in tension, for example in the roof of a conservatory. Then in 1856, Henry Bessemer invented the Bessemer Converter, which enabled steel to be produced more cheaply than ever before. Unlike wrought iron, steel contains no slag and it has a higher carbon content than puddled iron. As a result it is harder and even better in tension. By the late 19th century wrought iron was in decline. Because metal is so hard it engenders a false sense of security. Metal is often fragile, particularly where weakened by rust. Damage may be hidden by rust and paint, and joints are most vulnerable where water has been drawn in by capillary action, rendering the material liable to further damage when dismantled for repair. Furthermore cleaning and repair methods tend to be designed to overcome the hardness of the material and can be extremely damaging as a result. 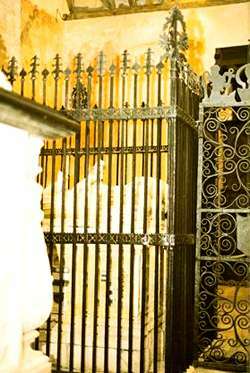 It may be possible to carry out minor repairs in situ, but for most major work, wrought ironwork must be dismantled and cleaned so that a full assessment of its structure can be made in the workshop. Where ironwork is anchored in damp stonework it is essential that it is removed, repaired and refixed since rusting iron expands to many times its original size, exerting enormous pressure on the surrounding stonework in the process. Fortunately, where fixings were let into the stone, the hole was usually filled with molten lead, and it is usually possible to remove it by heating the metal until the lead melts. Before removing the wrought ironwork (and indeed before any work is carried out to this or any other historic component) its condition, design and relationship with the rest of the structure should be carefully recorded and documented - by photographs at the very least. The record will be essential for reinstating the component later and may prove invaluable if further damage should ever occur. Metal to metal joints were made either by welding one piece of metal to another in the forge, or by using a mechanical fixing. These included mortice and tenon joints (early work was heavily influenced by joinery techniques), rivets and collars. A rivet is essentially a flat-headed pin which grips two pieces of metal together through the middle, and collars achieve a similar result by wrapping tightly around two or more parallel pieces (see illustration). Joints which rely on a mechanical fixing may appear to provide a simple, reversible means of dismantling a piece for repair. However, once broken it can be extremely difficult to return a complex object such as a gate to its original shape, so further dismantling is avoided wherever possible. Grit blasting, the method most commonly used to remove paint, can be highly damaging as it is liable to remove not only the paint but also the original 'mill scale', the outer surface of the iron formed in the forge. According to Chris Topp, even 300 year-old work typically retains 90 per cent of its mill scale, and as this is a protective surface in its own right, removing it may lead to accelerated decay. Its surface may also contain features which are of considerable interest, such as the original file marks, and on material designed for internal use it will retain its original polish. Paint removal is therefore best carried out using chemical agents chosen according to the type of paint and the need to avoid damage to the metal itself. After the paint is removed, care should be taken to ensure that any chemical residues are also removed or neutralised. Rust is most easily removed following the application of heat as rust scale does not expand to the same extent as iron, causing its grip to be sufficiently loosened for it to be brushed off. All repairs are best carried out using the same material and techniques used originally. However, repairs to both puddled and charcoal iron can be made quite successfully using puddled iron because the two materials are relatively similar in nature. Charcoal iron is difficult to obtain, whereas there is a relatively plentiful supply of puddled Victorian iron from, for example, Victorian engineering dismantled in recent years. Mild steel is more prone to rust than wrought iron. Steel bars (mild or stainless steel) tend to be used in standard section sizes resulting in a uniform appearance which lacks the character of early, hand forged bar work, and fail to match the Imperial section sizes of rolled wrought iron. Wrought iron is usually pieced together using forge-welded joints, with sections fixed together on site. Steel does not weld in the fire as readily as wrought iron, so arc-welding tends to be used throughout. This results in a different design approach as well as differences in detail which are easily recognised in most modern work carried out by non-specialist craftsmen. It is not always practical to weld wrought ironwork in the forge. Wrought iron can be arc welded in situ, when necessary. Due to the fibrous nature of wrought iron it is most important that any weld extends to the full depth of the material, to ensure that all the laminated elements of the original are connected. Surface welds have no strength as the weld relies on the thickness of a single laminate, which is often less thick than a cotton thread. Where arc welding is required, mild steel wire or rods should not be used as the steel will corrode. Either dissimilar metals or a non-corrodable iron alloy wire or rod is required. Thorough protection from the weather is vital for all exterior ironwork. When reassembled, interior faces of joined elements may be bedded in a modern silicone mastic as an alternative to the red lead putty used traditionally. All surfaces should be carefully painted, taking care to include the underside of repoussé ornament. A wide variety of paints are available to reduce the risk of rusting, including epoxy resin based paints and red lead or zinc-rich undercoats. Care should also be taken to avoid collection points for moisture and, once painted, recesses may be filled with a suitable filler such as pitch (the traditional solution) or an epoxy resin. Galvanising is generally considered inappropriate for historical fittings, particularly for delicate and highly detailed pieces, mainly because the metalwork has to be dipped in acid prior to galvanising. The acid etches the surface, damaging more vulnerable elements particularly where retained in pockets by more complex forms. Interior fittings were sometimes protected with oils or waxes. According to John and Nicola Ashurst in the English Heritage Technical Handbook (see Recommended Reading) 'A traditional treatment for wrought iron was to scrape, chip or pickle the surface until all scale and foreign substance was removed. A heavy coat of linseed oil was applied, then the iron was heated and wiped over with emery cloth. Finally a combination of beeswax and boiled linseed oil was rubbed into the surface'. The book also mentions a number of other alternative treatments such as lamp black and goose grease for interior ironwork. STEVE SUFF of The Real Wrought Iron Company.